What we did have was one outstanding dinner. We broke from tradition and made a new meal that was a welcome relief. This year it was a conglomeration of the best flavors we could come up with. Instead of sticking to the Thanksgiving script, we decided to make this food holiday about the food that we love rather than the food we are supposed to eat. Each person brought something different; each person shared a little of themselves in the process. They were small gifts to each of us, from each of us, enjoyed together. There were, of course, a lot of meats. Jamie called it a "meat-fest" and it pretty much was. Dave laid out an amazing collection of charcuterie and cheeses as an appetizer. Delicious cured salamis--thin and fat--from Olympic Provisions and imported cheeses from New Seasons--soft and hard--one of which was the best blue cheese I think I've ever eaten. 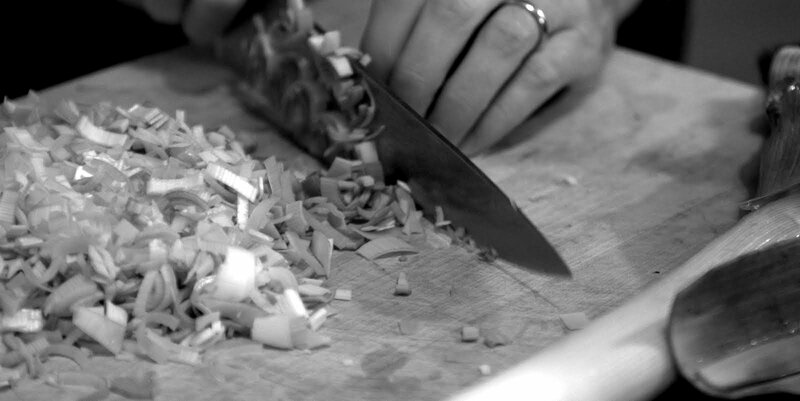 By the end of the night, I realized that in the hurley-burley of getting dinner ready, we did not spend enough time with this part of the meal. When dinner did get on the table, it looked like a winter feast of foods. I brought a sirloin tip roast. Dave brought a full king salmon fillet topped with pesto and laid on a bed of parsley. Tiffany brought her infamous champagne mushroom risotto as well as yams with yogurt. Jamie provided the beet salad. 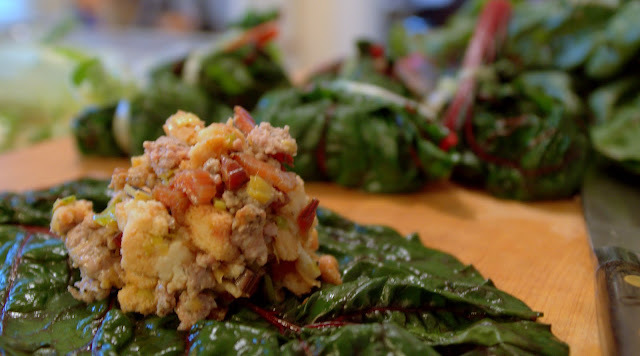 I made chard packages filled with sausage stuffing. There was fruit salad. There was a lot of wine. Desert was no different. Pumpkin pie is wonderful, but custards are more wonderful. So, pumpkin creme carmels it was. Pecan pie also showed up, as well as a beautiful apple pie. Sitting around a table of food made by people who are sharing from themselves, and enjoying that experience with those same people has to be one of the great experiences of life. We do several big meals a year--birthdays, holidays, etc.--but none is a holiday really devoted to breaking bread together the way Thanksgiving is. It's a unique time. It's a wonderful time. Thank you to all my friends, for sharing. Stuffing is good stuff. I actually wish we ate more of it the rest of the year instead of reserving it mainly for holiday times. With no turkey to stuff, I had to come up with something different. This worked perfect. This is a cosmetic variation on the recipe from The Best of Gourmet, 20th anniversary edition. The original calls for the chard leaves to be drawn up into a "purse" shape. However, I found this impossible to do. 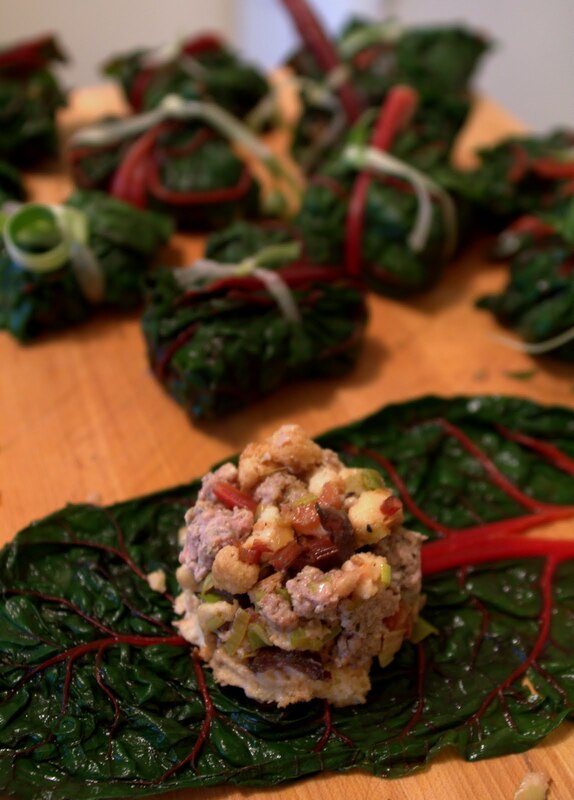 What was much easier--just fold the chard leaf over the stuffing and use the leak strips to tie it closed. The flavors of the stuffing are simple and down to earth. The bread is a nice medium for the salty, sage-y sausage and the earthiness of the only 2 vegetables. Add salt and pepper and it is a nice uncomplicated stuffing. Red chard stems and leaks chopped and sauteed in the sausage fat. 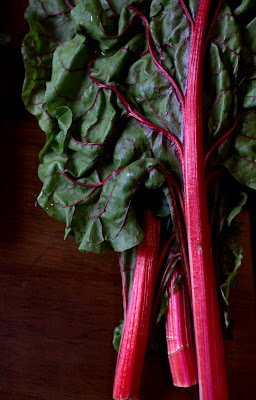 For the packages use blanched chard leaves. Plop a half a cup of stuffing in the middle and fold the leaf over. Use strips of leak to tie it closed. Bake with a little bit of chickstock to keep them from drying out. I made a sirloin tip roast, but I knew it would need something to help it. There was a good chance I would mess up the roast (it did come out a little over cooked) and a good sauce can help bring almost anything back to life. But what kind of sauce? In these moments of culinary confusion, I frequently turn to The French Menu Cookbook by Richard Olney. Once again, i found what I needed to find. As an accompaniment to a formal autumn dinner, he puts Poivrade Sauce with a leg of venison roast. But does it only go with game? I checked in with my Larousse Gastronomique and found that no, Poivrade Sauce goes with most red meats but as some well known variations for game meats. One thing to know about Poivrade Sauce, is that it is an old school (1700's) french meat sauce. What that means is the flavor profile will be more vinegary. It also means you will be able to find 100 variations of this sauce because everyone does it differently. Given those circumstances, you can really bend the flavors of this sauce to be whatever suits you. Poivrade sauce is in the general family of sauces that use black pepper as a main flavor. I stayed pretty close to Olney's formula. Carrots and onions and soup bones all sweaty and browned. Beef stock, tomatoe juice, herbs and juniper berries simmered for a few hours and reduced. Add crushed black peppercorns at the end. Add some butter to make it shine. I also used more flour at the end to thicken it up like a gravy. Pumpkin pie is delicious, not for the pie, but for the pumpkin. Custard is delicious, for every reason. What better time of the year to get two great tastes that taste great together? I checked in with my buddy Alfred Portale. In 12 Seasons of Cooking he has a nice recipe for Pumpkin Creme Brulee. However, I had just eaten creme brulee a couple weeks ago. So, it had to be creme caramel instead. Of course, for the definitive recipe for custard anything, I have to check in with my other buddy, James Peterson. In chapter 46 of Glorious French Food, he gives the best overview of each kind of custard and how to make them I have ever read. Basically one egg will set 2/3 cup of milk. After that come the variations, and there are a ton of them. I used his orange creme caramel as the starting place and infused pumpkin flavors instead. Here are a few random pictures from the night.